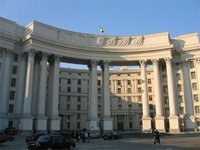 Ukraine hopes that foreign countries and organizations will refrain from supporting unlawful actions and attempts to disturb the calm situation in society on the part of Ukrainian citizens, reads a statement posted on the Web site of the Ukrainian Foreign Ministry. This issue was discussed on Monday at a meeting between senior Ukrainian officials and the ambassadors of the EU member states, the United States and Canada, during which they discussed the events near the Kyiv-Sviatoshynsky court on January 10-11. The Ukrainian side expressed confidence that the announcement of the verdict against the so-called "Vasylkiv terrorists" at the Kyiv Svyatoshinsky court has nothing to do with rallies on Independence Square, but could be used as grounds for provocations. As for further events after the announcement of the verdict, the statement notes: "Some MPs, hiding behind their status as people's deputies of Ukraine, entered into a violent confrontation with police, blocked the courthouse and the roadway around it. At the same time, the results of a medical examination of those who suffered in clashes with the police reveal some facts of them being in a state of alcoholic intoxication. This also concerns one prominent opposition politician." In the context of what happened the Ukrainian side told foreign diplomats: "Ukraine hopes that the international partners of our state will remain objective and impartial observers and demonstrate restraint in assessing the events in Ukraine, which is a matter of the internal development of the state. Our state, especially in a spirit of devotion to common European values and standards, also expects that foreign states and organizations will refrain from supporting unlawful actions and attempts to undermine a national boat of peace, but instead will make a contribution to the stabilization of the situation in Ukraine." At the same time, the Ukrainian government is ready for a dialogue with international partners on these issues if it is held in a constructive manner, in an atmosphere of openness and mutual respect. According to the Foreign Ministry, the Ukrainian side at the meeting with the ambassadors was represented by Foreign Minister Leonid Kozhara, Deputy Interior Minister Viktor Ratushniak, First Deputy Health Minister Oleksandr Kachur, Deputy Prosecutors General Viktor Voitsyshen and Lilia Frolova, and First Deputy Head of the Security Service of Ukraine Volodymyr Totsky. As reported, on January 10, the Kyiv Sviatoshynsky court of Kyiv region found Ihor Mosiychuk, Volodymyr Shapra and Serhiy Bevz guilty of the intention to blow up a monument to Lenin in Boryspil during the Independence Day celebrations in 2011 and sentenced them to six years in prison each. Activists tried to block a prison van with the convicts. Clashes between the Berkut special forces and the protesters were reported. Automaidan activists later blocked buses with Berkut police officers near the Sviatoshynske district department of the Ukrainian Interior Ministry's main office in Kyiv. The activists demanded that law enforcers remove the masks and show their faces. Ex-Interior Minister Yuriy Lutsenko sustained serious injuries when attempting to prevent clashes between the protesters and the security forces. He was hospitalized.